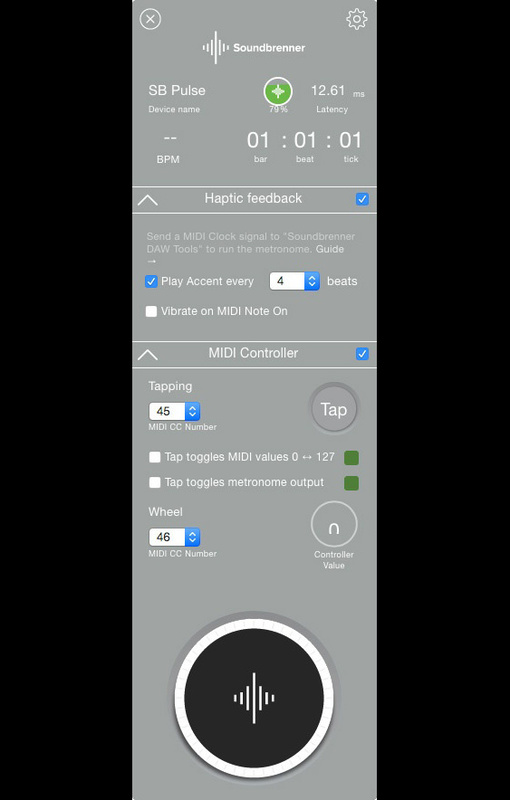 The world’s first wearable metronome for musicians offers an armoury of tempo-related features to help improve your timing and really get your groove on. For a musician, timing is one of the most critical elements of any performance. The feel, groove and tempo can often be what defines a piece of music, and getting that right is something we all aim for, regardless of what instrument we play. I am, first and foremost, a drummer, so timing plays a big part in what I do. I have all manner of tempo apps on my phone and iPad, from audible click tracks to flashing lights and bpm displays. We seem to be constantly searching for something that will solve all our problems and instantly make us ‘a better player’. Could the Soundbrenner Pulse be the answer? 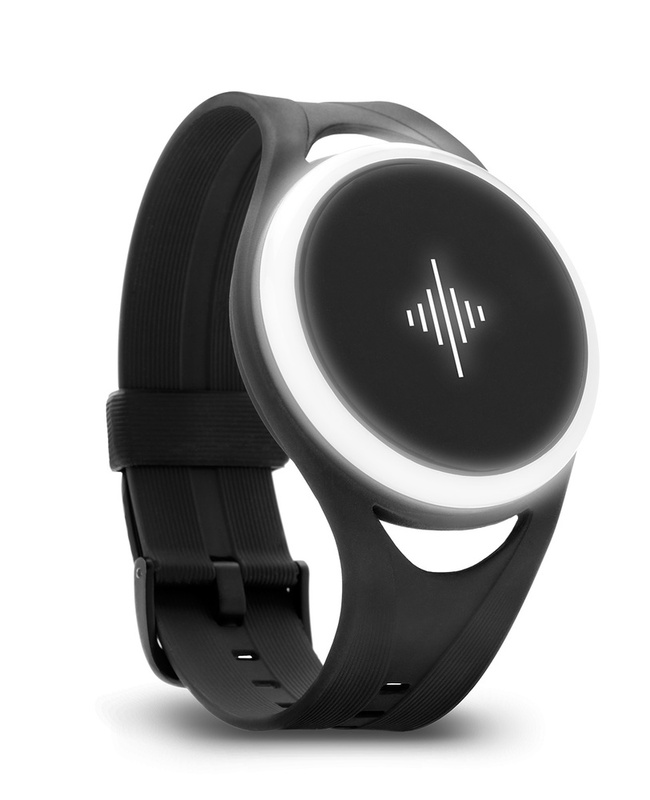 The main screen lets you select any combination of time signature and subdivision and apply one of three vibrations and the desired colour to each beat, allowing for quite complex rhythms to be programmed.The Soundbrenner Pulse is the world’s first wearable metronome for musicians. As you may have gathered from the name, the Pulse uses strong vibrations in combination with more familiar visual and audible cues to provide tempo information to the wearer. The packaging is classy. It certainly makes you feel like you’ve got a high-end product even before you’ve got your hands on the actual device. Sliding the box open, you find that the Pulse itself is a neat, circular unit around 5cm in diameter and 1.5cm thick. The casing is made from a hard plastic, and although it’s all very light it certainly feels substantial enough. A wheel runs around the edge of the upper face and, when rotated, controls tempo and a couple of other little tricks I’ll come to later. The wheel feels solid and clicks very positively as you rotate it, with each click representing a single-digit change in bpm. Both the edge wheel and the logo in the centre of the upper face flash in various user-definable colours, along with the beat of the metronome. Neatly presented in the box next to the Pulse itself is the circular magnetic charging station, powered by the provided micro USB cable. In addition to the simple and very easy to understand manual are two rubber straps, one short and one long, that the Pulse unit fits into. They provide options for where to wear the Pulse; the shorter strap is suitable for the wrist and the longer one is ideal for the upper arm or ankle. Sadly, my Pulse came without any charge, but that did give me an opportunity to try the charger. The Pulse attaches itself to the charging station with a firm magnet, and as it’s charging it pulses orange, which changes to a solid green when fully charged. Typically, you should get around eight hours’ constant use from a single charge. The Pulse can be used as a stand-alone metronome straight out of the box. Touch the front face of the device with two fingers for a couple of seconds to activate it, and the Pulse vibrates into action. A simple double-tap of the front face starts a basic 4/4 rhythm, with the outer bevel wheel enabling you to increase or decrease tempo. Tapping the front face three times or more makes the unit adjust to your tap tempo. In itself, it’s very useable, but the vast majority of the Pulse’s features are accessed via the companion app, The Metronome, which is available for iOS and Android. Adjust the on-screen tempo wheel (conveniently looking like the Pulse unit itself), press play and the app and Pulse play in perfect sync, producing physical vibration and colour flashes from the Pulse, along with the audible click from the app.Communication between the app and the Pulse is via Bluetooth, so first you need to pair your Pulse with the app on your phone or tablet. This is achieved via the ‘Add Device’ option. 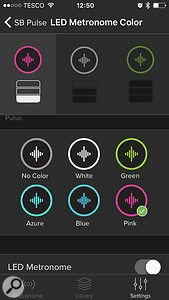 Any currently active Soundbrenner Pulse is detected and ‘added’ to the app. It’s worth mentioning here that up to five Pulse units can be controlled from the app. This means that potentially every member of a band could be wearing a Pulse and playing along to the same metronome click. This opens up quite a number of interesting opportunities for bands that don’t have, or don’t want to use, in-ear monitors and a click track. 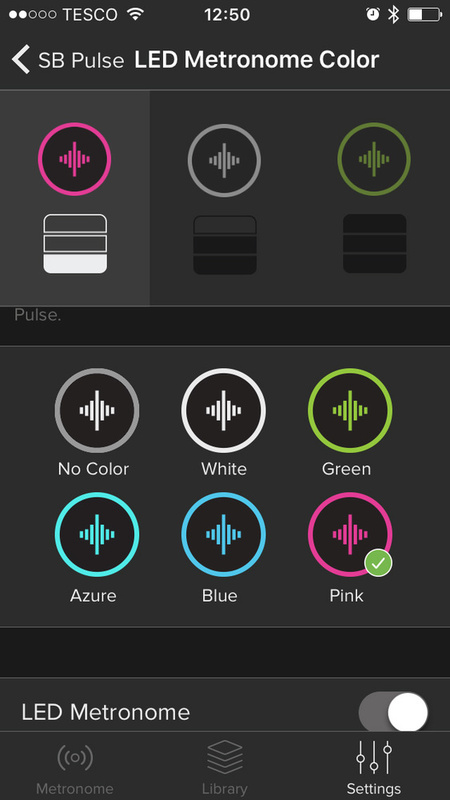 Once the app is connected, you can start to customise the Pulse. Up to three different physical vibrations can be set, typically to represent a downbeat, an offbeat and a further subdivision. Each of these vibrations can be linked to a different colour — white, green, azure, blue or pink — or no colour, and each vibration can have one of nine different intensities and lengths. The final area of the app to explain is the Library. Here you can store and recall any rhythms you’ve programmed. I found this very handy for storing slightly odd time signatures or grooves to practice with. In addition to storing rhythms, the Library area also lets you save Set Lists; as the name suggests, these are lists of rhythms from your Library that could represent live set lists for your band, for example. An infinite number of rhythms and Set Lists can be created, all named and easily edited into any order, making it a very useable tool for the live player. It’s not all one-way traffic, either. The Soundbrenner Pulse can send MIDI information back to your DAW. MIDI Controller messages can be assigned to taps on the face of the Pulse and to the outer bevel wheel.All this talk of playing with a click does lead us to the question of what we’re playing along to. 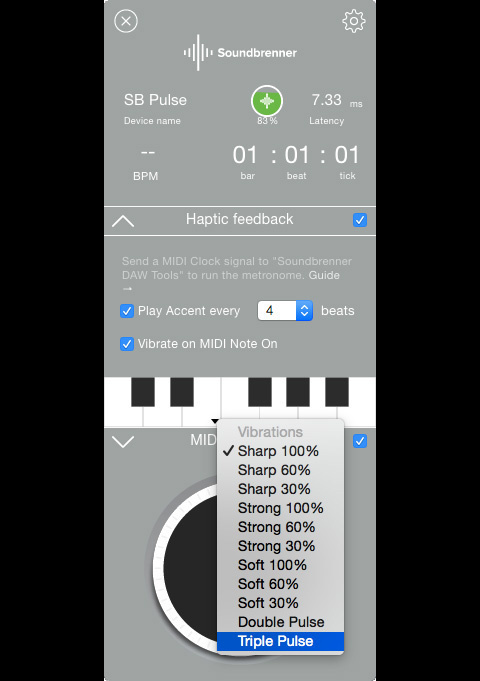 The Metronome app lets you create those Set Lists of songs that will give you the tempo for each, but what if you want to play along to a backing track or record to a click? Surely you need your DAW and a click track? Soundbrenner have thought of that, with a neat little app called DAW Tools. Downloaded and installed on my Mac Mini, the DAW Tools app opens with a splash screen while it searches for an available Pulse unit. I used the app with MOTU’s Digital Performer 9 but it will, of course, work with any Mac DAW. To enable communication in DP9, it’s simply a case of opening the ‘Transmit Sync’ option in Preferences and selecting the Pulse. Pressing play on the DAW causes the Soundbrenner to vibrate in perfect sync with the MIDI Clock pulse. It really is as simple as that. Any tempo changes in the DAW song are followed by the Pulse. The DAW Tools app gives you a reading of bars and beats, a bpm display and a latency figure. As MIDI Clock doesn’t contain Time Signature information, you can set a downbeat accent pulse in the DAW Tools app on any beat. Typically, in 4/4 you’d choose beat four, but you have the option to select beat three for a waltz, or seven if you’re in a prog rock band. Currently, the DAW Tools app is Mac only (see the ‘Compatibility’ box). 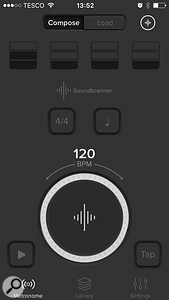 However, users of Ableton Live can use the Pulse on both Mac and Windows platforms via support for Ableton Link in the latest version of the Metronome app. 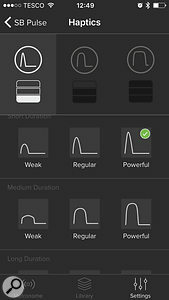 As it’s working via the iOS Metronome app, the tempo-control aspects of the Pulse (tap tempo via the front face, tempo control via the bevel wheel) can even be used to control the playback tempo of Live in real time. 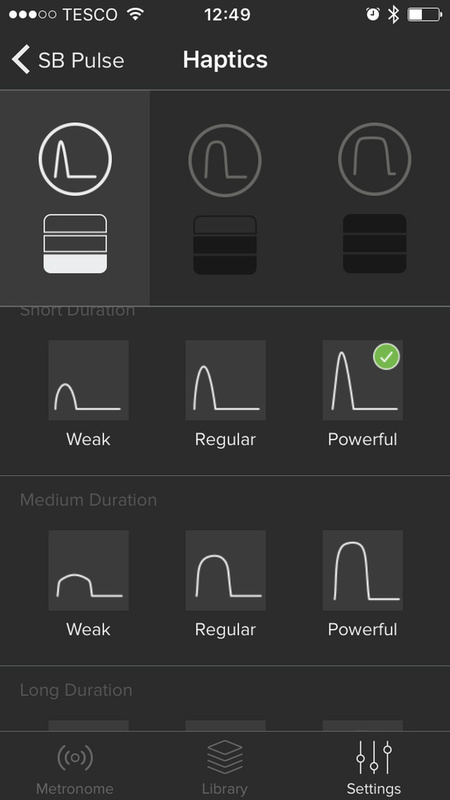 A very cool feature of the DAW Tools app is the ability to assign different vibration waveforms (distinct from the timing vibrations) to specific MIDI Note values across an octave. This can be used to set up a ‘cue’ track in your DAW. Simply insert note values on a MIDI track at specific bar positions in the song, and waveform vibrations will be sent to the Pulse to notify you that you’ve reached that bar. 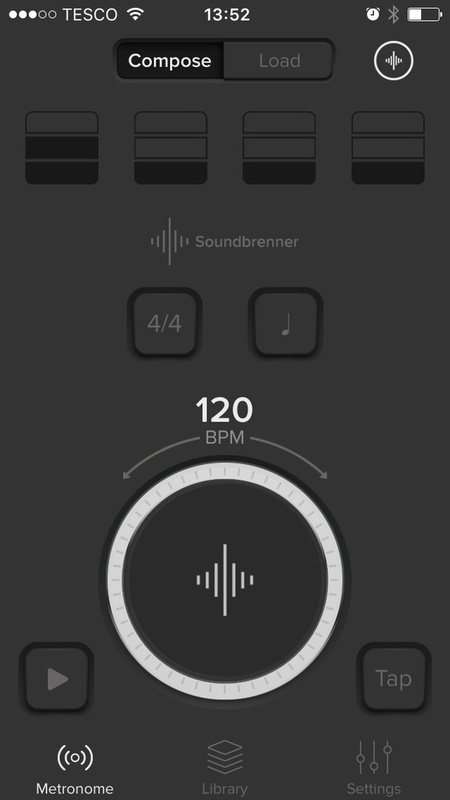 It’s a handy feature to save you counting bars through a long solo section, for example.The Soundbrenner Pulse is a unique piece of equipment, and for that reason it does, perhaps, take a little getting used to. The first dilemma is where to wear it, and that’s going to come down to experimentation and what works for you. Personally, I found wearing the Pulse against my shin bone worked well, although I also think, as a drummer, that an even stronger vibration wouldn’t go amiss. For less physical instruments, the current level should be absolutely fine. Feeling a click isn’t something that most of us are used to, so initially I found I had to concentrate on the vibration more than I expected in order to keep in time. Having previously used a flashing metronome, I found the combination of the physical vibration and visual feedback from the Pulse worked well but this is, of course, dependent on where you wear the pulse. As I’m more used to playing with a traditional click, I also tried a combination of the Metronome app click in my ears plus the Pulse, and this worked really well. I was able to keep the click at a far lower volume than normal and eventually not use the click at all. Ultimately, you have potentially three different types of tempo feedback — vibration, visual and audible click — so you should be able to find a good balance that works for you. Click tracks can be very tiring on the ears, so the idea of no click — or at least one at a vastly reduced level — is very appealing. Not only that, but when recording quieter passages I’ve occasionally picked up bleed from a loud click track via a pair of headphones half on. The Pulse helps to eliminate that problem. The ability to link multiple units is also a big plus if you’re working with a band, live or in the studio, sending a ‘silent’ click wirelessly to every member of the band. The Soundbrenner Pulse is certainly something I’ll be using in the future as an alternative to an ear-damaging click track. I really like the innovation and thought that has gone into the product and, if recent updates are anything to go by, you certainly get the feeling Soundbrenner are constantly looking at ways of improving, refining and adding to this innovative and useful device. 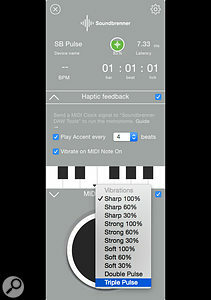 There are a few limitations with regard to compatibility of both the DAW Tools and Metronome app. These are detailed on the Soundbrenner web site and basically boil down to the need for the device you’re using to support Bluetooth 4.0 (also called Bluetooth Low Energy, or Bluetooth Smart). The iPhone 4s and onwards, the iPad Mini and third-generation iPad onwards are all supported, and all require iOS 8.4 or later. Most Android devices from 2011 onwards, running OS 4.3, should also be supported. Currently, the DAW Tools app is only supported on Mac OS running 10.10 or above. Low Energy Bluetooth support is also required, which includes most Macs from 2011 onwards. You can check your Mac compatibility by looking in the System Report in ‘About this Mac’. If your Mac is equipped with Bluetooth 4.0, the LMP Version will say ‘0x6’. Anything lower than that is an older and incompatible version of Bluetooth. If your Mac doesn’t support Bluetooth 4.0, however, it is possible to buy a USB Bluetooth Low Energy dongle. As for DAW compatibility, DAW Tools should be compatible with every Mac OS DAW that supports MIDI Clock output. Inside the Pulse is a large Eccentric Rotating Mass vibration motor, or ERM, which produces a vibration 700 percent stronger than you would find in your mobile phone. In fact, the motor occupies almost a third of the space inside the unit. To harness this vibration power and give it accuracy, the Pulse incorporates a patented Haptic Driver, enabling the device to produce a distinct and powerful vibration on each beat. DAW support limited to Mac OS. The Soundbrenner Pulse is an innovative and feature-packed product that literally brings a new dimension to both practice and live performance with a metronome or click track. $99. Discounts are available for multiple purchases.